This festive spiced cranberry-orange punch can easily be adapted to be a high-octane adult beverage or a non-alcoholic family libation. The holidays are basically about creating memories and pleasing people you care about. If you’re hosting any holiday festivities this year, it’s a given that you’re already feeling the pressure of what memorable “special something” to serve your guests. This isn’t the time to get creative and come up with recipes on the fly; instead, it’s best to rely on tried and trusted recipes that consistently please year in, year out. With Thanksgiving officially behind us, it’s time to focus our attention on the two biggest family-oriented holidays in December: Hanukkah and Christmas. While I almost always focus on the food portion of any holiday menu, my husband is acutely focused on the beverages. 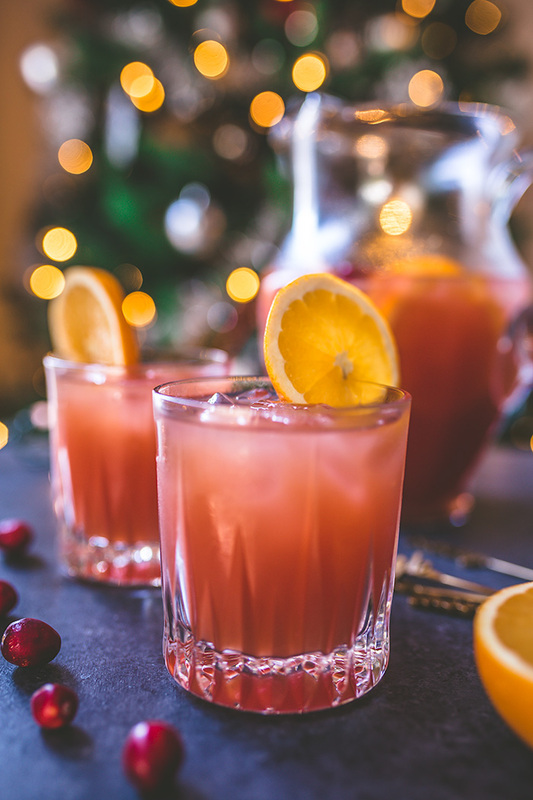 A few weeks before Thanksgiving, I asked him to create a couple of festive cocktails that I could share with you all, and today’s festive holiday punch recipe is one of those recipes… we’ll see if the other one ever sees the light of day. :) I hope it does because his test runs have certainly helped me cope with the stress of work, preparing for an upcoming trip I’m taking with my father to NYC (for the second year in a row we’ll be spending the holiday in the Big Apple, hopefully giving my husband enough space to finish the floor!!). I know the trip is still a few weeks away, but this time of year, time just flies by. I kept going back and forth whether or not I wanted to share the nonalcoholic version or the boozy version. Ultimately, I decided to share both versions, just to make things easier on you guys at home. At its heart, this is such an easy holiday punch recipe that it deserves to see the light of day a couple of times between now and New Year’s Eve. It’s kind of one of those “hurry up and wait” recipes because after you bring the liquid to a boil, it needs to cool to room temperature before being refrigerated overnight. The husband claims this easy holiday punch is best after 48-hours in the refrigerator, but I personally thought it was just as good after 12-hours in the fridge… plus, it’ll save on space in the refrigerator, which lets face it, during the holidays space in the refrigerator is always limited. And maybe most importantly, the basic punch ingredients, not including the alcohol, can be purchased for under $20! As I mentioned earlier, this punch recipe is SO easy for a couple of different reasons. #1: all the ingredients that make this festive punch so special are easily found at the Kroger family of grocery stores: Simply® Orange, Simply® Cranberry, and Sprite® Cranberry. All of the ingredients for this Spiced Cranberry Orange punch are all easily found within Kroger, making shopping a breeze! For more holiday inspiration, be sure to check out this brilliant Coca-Cola® Kroger advent calendar every day this December! This festive spiced cranberry-orange punch can easily be adapted to be non-alcoholic. Pour the Simply® Orange Lt and Simply® Cranberry Cocktail into a large pot and set over high heat. Add the cloves, cinnamon, nutmeg and bring to a boil. Reduce the heat to low, cover and simmer for 20 minutes. Strain mixture. Set aside to cool to room temperature, about 1/2 hours. Cover and refrigerate for at least 2 hours, up to 5 days. Put the ice in punch bowl and add the chilled punch. Add the orange wheels, Sprite® Cranberry for the fun fizzies and serve. Pour individual glasses and add any alcohol you may want to use if spirits haven’t already been added.